Mary Chase Stratton’s interest in ceramics began as a teen when she studied china painting in Detroit with Bohemian artist Franz Bischoff. After studying at the Art Academy of Cincinnati, Stratton helped establish the Detroit Keramic Club and later studied with Charles F. Binns in New York. At the turn of the century, Stratton began experimenting with various glaze formulas and firing techniques with Horace I. Caulkins, inventor of the Revelation China Kiln. Together they founded Pewabic Pottery in 1903. At the request of Pewabic enthusiast Charles Lang Freer, Stratton began experimenting with iridescent glaze effects, and her interest shifted from form to color. This classic Arts and Crafts vase was first decorated with a fritted (fused glass powder) glaze over which Stratton applied an iridescent glaze. The effect is suggestive of a landscape that shifts in varying light. 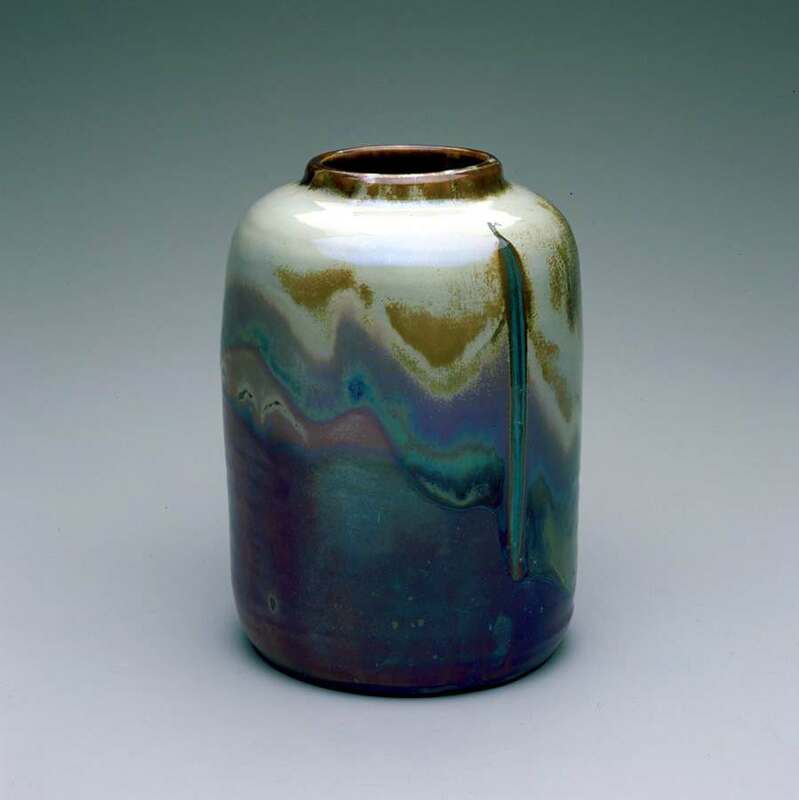 Two cascading vertical lines of spar-copper glaze connect the earth tones of beige, sienna and umber on the upper portion of the cylinder with the smoky silvery grays that slide into the blues and purples (Stratton’s favorites) on the lower portion of the vase.